With bow and muzzle season about to pop, take aim at these warm-weather field-dressing venison care refreshers. Yes, you've been white-tail hunting since you were chest-high to a 10-pointer. But you can still learn a few things – particularly if it boosts deer venison quality, right? Then take a quick read of these field-dressing tips from Dr. Walter Cottrell, Pennsylvania Game Commission wildlife veterinarian. They're especially important during warm weather. Before first sighting: Sighting and practicing with your sporting arm is the first step, says Cottrell. Coupling that with smart shot placement ensures a clean kill and minimal damage to edible parts. NOW FOR THE MOST IMPRTANT PART: Now that the excitement's over, speedy field-dressing your deer is the essential next step in harvesting fresh tasty venison. After tagging: Wear latex or nitrile gloves to remove the entrails – without rupturing them. Then drain excess blood from the cavity and whip it down with a dry cloth or paper towels. Do not wash out with water. Reason: Wet or damp meat spoils more quickly and is more prone to spreading bacteria. Chill-down ASAP: To hasten cool-down, skin deer and hang the carcass in the shade, refrigerate it or place an ice bag in the body cavity. Never place a deer carcass – with or without the hide – in direct sunlight. 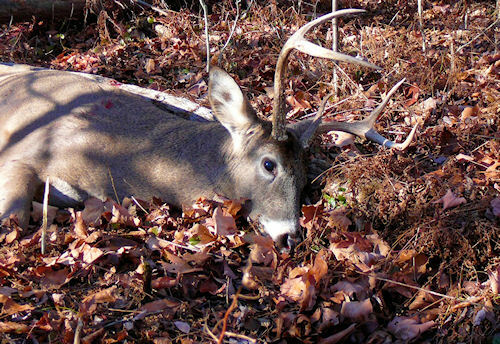 "The bacterial load of a deer harvested in warm weather multiplies quickly. That's why Cottrell emphasizes, "Its' so important to dress the animal as soon as possible, transport it from the field, remove the hide and refrigerate the carcass." Hide removal: For those who process the deer themselves, the next step is to remove the hide, which comes off easier if the front legs are cut off at the elbows, and the rear legs are removed just below the knee joint. Begin by cutting the hide from each leg, then back to the body trunk. Cutting the rear legs just below the joint also makes it easier to hang the carcass by the large tendons on the back legs. Peel the hide, working down toward the head, then remove it with the head, along with all of the trachea or windpipe. Immediately wipe the carcass dry. Remember, rinsing with water can hasten the spread of bacteria. Final inspection: Inspect once again for any blood and hair. Removing large fatty deposits also will improve the meat quality and helps lessen that "game taste" some people dislike. Note: Fat is more easily removed after it has cooled. Now your venison is ready for a meat processor's refrigerator, or quartering and placing it in your refrigerator. If air temperatures are above 50 degrees, get the carcass refrigerated as soon as possible. A link to a video on deboning in the field can be found at the Game Commission's website: www.pgc.state.pa.us . There, you'll also find downloadable brochures with more specific details on deer field dressing and cooking tips.